University of Maine men's basketball coach Richard Barron is pictured during a women's game in 2016. 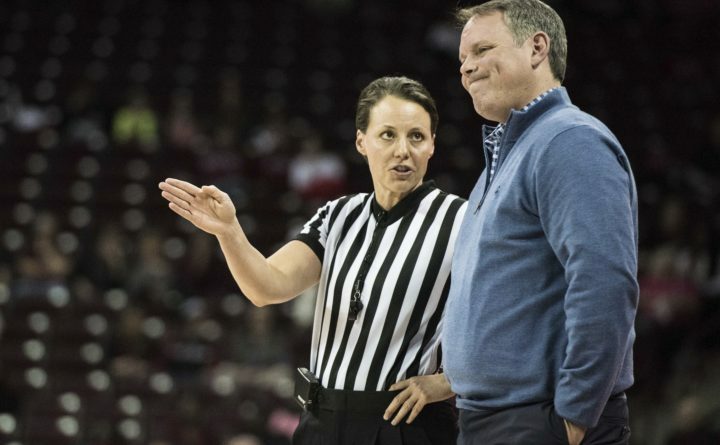 The first eight months of Richard Barron’s tenure as the University of Maine men’s basketball coach have been a buzz of transitional activity. From putting together a staff and recruiting eight new players to leading a team-building trip to Costa Rica over the summer, Barron has been working to instill a philosophy within the program that proved successful during his seven years as the Black Bears’ women’s basketball coach. “It’s been a lot of fun, honestly,” 6-foot-7 UMaine junior forward Andrew Fleming said of the program’s direction since Barron replaced Bob Walsh as the Black Bears’ men’s coach in early March. “Going to Costa Rica was great for the team, and everything else has just come so quick. Every day is almost like a new day, but we try to make it the same so we can build habits and improve every day,” Fleming continued. Barron’s early approach looks similar to how he elevated the Black Bear women’s basketball team from a 4-24 record during the 2012-13 season to back-to-back 20-win seasons in 2015 and 2016 before he was forced to take a medical leave in January 2017. Consider it a strategy of patience and pace. The need for patience comes in great part from understanding that the UMaine men finished 6-26 last winter and 24-100 over the past four seasons. The Black Bears have never qualified for the NCAA Division I tournament. UMaine begins its 2018-19 schedule Tuesday night with the first stop of a three-game western swing at the University of Denver. The team travels to the University of Utah on Thursday and then plays at the University of San Francisco on Saturday. The Black Bears will play their home opener Nov. 28 against Princeton at the Cross Insurance Center in Bangor. Even though UMaine was picked for its highest finish since 2012 in the recent America East coaches poll, the fact that it’s merely a tie for seventh place with New Hampshire, just ahead of cellar-dwelling UMass Lowell, indicates the starting point for this year’s team. Fleming (9.7 points and 5.3 rebounds per game in 2017-18) and Stojiljkovic (4.3 ppg, 5.1 rpg) are two of the elder statesmen on this year’s club, along with 6-5 redshirt junior guard Isaiah White (11.1 ppg, 4.6 rpg) and 6-8 redshirt junior center Vincent Eze, who missed last year due to hip surgery. Another senior, 5-10 guard Celio Araujo, is back for his second year with the program, as is 6-8 sophomore forward Miks Antoms. They are joined by a group of newcomers led by 6-4 junior point guard Sergio El Darwich and 6-8 sophomore forward Vilgot Larsson, both junior college transfers who started in UMaine’s 82-40 exhibition victory over UMaine-Presque Isle last Thursday. Other new Black Bears expected to contribute include 6-5 sophomore guard Misha Yagodin and 5-10 freshman guard Terion Moss, the reigning Mr. Maine Basketball from Portland, with 6-7 sophomore Solomon Iluyomade and 6-9 freshman Stephane Ingo hoping to add to the team’s frontcourt strength. Chief among those roles are to facilitate a patient pace of play that runs somewhat counter to the norm in today’s shot-clock world but worked for Barron and his women’s teams at UMaine during their rise from the bottom of the league standings to the top. “We don’t want to take a shot we can get at any point in the shot clock, we want to be selective with the shots we take and be deliberate, we want to make the defense work,” Barron said.